Today has been all about Alfie’s dressage, which we did this morning, and more course walking. To cut a very long story short he did a very good test in parts, but we had some costly errors in the canter work. I felt the trot work was the best we’ve done in competition – he was really through and with me and showed off his wonderful paces with suspension and fluidity in the patterns. He was also calm in the walk. Sadly, however, it was a test of two halves and from the rein back onwards he started to show some tension and we made three costly mistakes which was very atypical for him. There will be plenty of time for analysis and reflection. Should I have given him more work, less work, a different type of work, worked on different patterns/movements – no stone will be left unturned but that is not what matters now. For now I want to reflect on the positives and focus on the task ahead, the cross country. I am just back from another course walk and the ground remains excellent. If the rain stays away the ground will be perfect to run on. 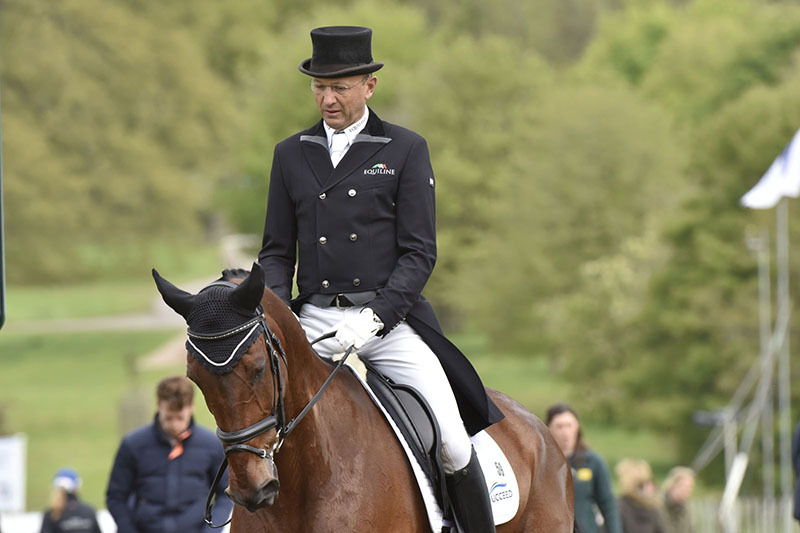 I remain of the view that Guiseppe has been very clever with the course – it’s a course that should give horses confidence but it will require positive riding and should not be underestimated. It will be interesting to see how much the turning questions take out of horses at the quarry and the lake complexes, as it is the turning and acceleration and deceleration that is always tiring on a horse – in an ideal world you want to find cruise control and the best rounds I’ve ever ridden are those which feel like you have never had to break up your rhythm. So we end the day in 15th place with lots of positives to take from the day and lots to focus on for tomorrow, with the aim of being on our dressage score at this time on Sunday with a sound and happy horse!